I started making these around the holidays. I tried a number of recipes and tweaked them a bit to come up with this. I store them in canning jars, on the counter and they are usually gone within a week. Everyone loves them. 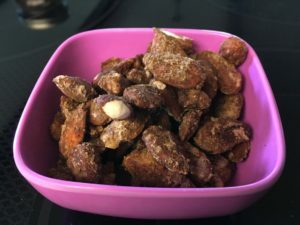 In a large bowl, mix all the nuts and spices together. In another bowl, whisk the egg whites until frothy and foamy. I use a stainless steel bowl. Pour the egg whites over the nut mixture and mix until combined. Spread the nuts out on a baking sheet. Bake 30 minutes – then removed from oven and mix it all up again – then put back in the oven for another 30 minutes – 1 hour total baking time. Cool and store in jars – enjoy!